What would you do if that which defines you was suddenly taken away? Who would you be? What if your dreams and ambitions hinged on your physical appearance above all else? These are difficult questions that would shake anyone’s foundation at the core. One woman in particular was confronted with these very questions and ended up learning the power of her own strength and resilience. Jannica Olin is a Swedish actress and activist based in Los Angeles who has transformed her big screen ambitions into a journey where she is inspiring so many others. In 2014 she learned she had Alopecia, which is a condition stemming from a confused immune system that causes all your hair to fall out. 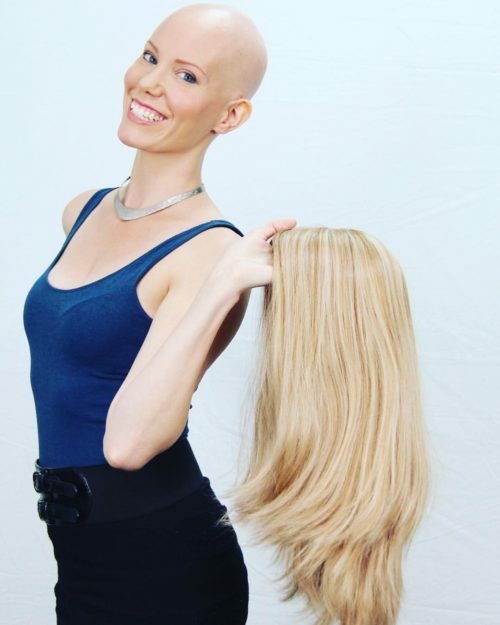 As a tall, blonde, attractive Swede setting out to conquer Hollywood, Jannica’s sense of identity and self-worth underwent a major reckoning due to Alopecia. 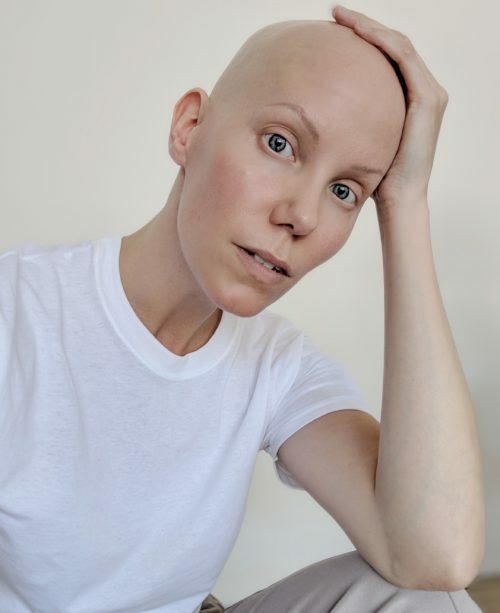 Today she uses her platform and extensive social media following to speak messages of power and beauty to others with Alopecia, especially young girls, who are also struggling with their identity. And Jannica has not given up her acting dreams either. In fact, she has discovered a superpower that has opened up numerous doors in a way that perhaps would not have before 2014. Tell us about growing up in Sweden and dreaming about moving to Hollywood to become an actress? Growing up in Sweden was great. I grew up in a smaller town and always felt that desire to discover the world. The dreams of Hollywood started early. I was so intrigued by the fact that you could live in a place with lovely weather, lots of opportunity and do what you love. I always knew that I would end up in Los Angeles, but I wasn’t in any rush to get there. I did some work in Sweden before I took off for Australia. It was after an acting class in Melbourne that I fell in love with the Meisner technique and I knew that I needed to move to New York and attend the Neighborhood Playhouse to receive the best possible training. After New York, I moved to London and worked in theatre and film there. But New York and Los Angeles were calling, and after about two years in London, I made my way back stateside. When you made it to Los Angeles, via Australia and the UK, what were your career plans and how did you start pursuing an acting career? I had good, professional training in my backpocket and had already worked in theater and film in New York and Europe. I think what’s important, is to just live where you want to live, and then start connecting with people and nurture those relationships. And it takes time. I think that’s so valuable to get. There are no quick ways to success. Focusing on the work and developing and nurturing professional and personal relationships is so important. I didn’t have solid plans when I got to Los Angeles. I just knew this was where I wanted to be. Because I had training and past work, it was more about getting to know the industry here and the people in it. And as I started auditioning here, that naturally developed and expanded. In 2014 your whole world got turned upside down after a major health diagnosis. Tell us about Alopecia and how you learned you had it? Yes, that was quite something. I discovered a bald patch in August 2013 and six months later, all my hair was gone. The doctors told me it was this auto immune condition Alopecia which means my immune system is super strong and super confused and treats my hair as a foreign object. So my immune system is healing me from my hair basically. That’s the only physical thing that happens. Of course, emotionally, it was a whole ordeal. You’ve spoken about how, as an actress, your looks were a huge part of your identity. 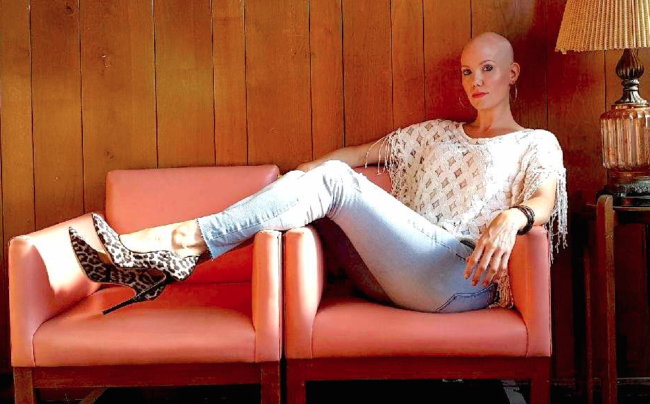 So how did alopecia affect your self-identity and self-confidence? So much of my identity was in my long, blonde hair and to all of a sudden not have any was very confronting. Who was I now? But I realized something very powerful. It was only when I looked at myself in the mirror that I was different. My thoughts, feeling and emotions were the same they’d always been. That’s when I got that I wasn’t my hair, and if I wasn’t my hair, I wasn’t my body either. I have it. There was a lot of freedom in that. Of course I have thoughts that are disempowering sometimes but I know that they are only thoughts and not reality. We all have moments of feeling ugly and unattractive but that doesn’t mean that you are. They’re thoughts that are born out of what we take in through social media, culture and advertising. I started seeing that I had an opportunity to help redefine what our idea of beauty, perfect and normal is supposed to look like. As a woman and as an actor I got really excited about what was possible out of having this cool superpower of physical transformation available to me. What were some of the most profound things you learned about yourself, and about beauty from losing your hair? I learned that I am resilient. Which I think we all are as humans. The difference lies in what kind of story we tell ourselves about what is happening or about what happened. I was losing my hair. That was all that was happening. It wasn’t easy to deal with, but I always had a deep faith in that this was going to be a blessing. One really beautiful thing is that my own idea of beauty has expanded. If I see other bald women now, that’s completely normal to me. But I also really love short hairstyles on women, which I never used to before. Because that wasn’t what was considered feminine and attractive in our mainstream media and culture. I’ve also learned that no one cares about the details of your appearance more than you. I lost all my eyelashes and I’ve gotten more compliments on my eyes than I ever did before. And I have had to show people that I don’t have eyelashes cause no one believed me. So the fact that women are out there getting eyelash extensions and stuff like that, is funny to me. Embrace what you have. Because when you do, you absolutely shine. As an actress, how did this major change impact your choices and how you were perceived by the industry? No one has actually ever said anything negative to me. I’m sure there are people in the industry that are a no because they don’t quite know how to cast me. Like, I am too many options, in one person! Which in my world is an asset. I’m at a point in my life where I don’t really care what others think. The most important thing is that I’m living my life with vulnerability and authenticity. That always wins at the end. And the industry will catch up with me on that. I love going out for roles now that I never would have before, when I had that girl next door look. Being unique and edgy looking is fun. But sometimes I think people then expect me to be different as well, a little edgier in my personality perhaps, to kind of match that, But at heart I’m still that blonde Swedish girl next door. 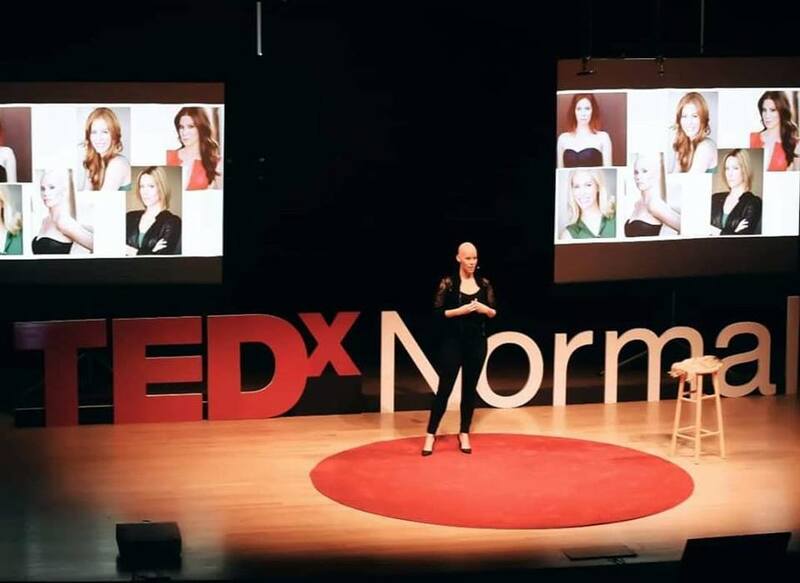 You recently did a TEDx Talk and spoke about your journey with alopecia. What was the experience like, sharing your personal story with such a big audience? I was nervous of course. But I felt so at home up there on that stage. Even though I work as an actor and have been on many stages, it’s always different when you are just you. You can’t hide behind other people’s words or direction. But it was a beautiful thing to have the privilege of sharing my story and what I’ve learned, and hopefully have that have a positive impact on someone else. Storytelling, in whatever form, is powerful and oh so beautiful. You also have a strong social media presence where you share videos, inspiring messages and updates about your career. What kind of responses have you gotten from followers and other people who have alopecia? Nothing but inspiring messages. Learning that someone gets some peace or inspiration around what they are dealing with, is a gift for me. If I open up about what I’m dealing with, it creates the space for others to do the same. And that is when we connect with each other authentically. How did alopecia open up unique opportunities for you for representation in the acting world? That has all been inner work. In the beginning when I realized I was going bald, I really thought my career was over. Or that I was going to have to hide with a wig that looked just like my own hair, and just never tell anyone. Again, I talk about authenticity and vulnerability a lot, but that really is key. My job opportunities now, have nothing to do with my look really. Well, it does and it doesn’t. But ultimately, it’s about who I am being about how I look. I love my new normal. I have moments when I don’t, and I let those moments be there and pass through. So the opportunities I have gotten as a bald actor, comes from me just being absolutely ok with who I am. What is your message to other people out there who feel as if their own bodies or appearance don’t “measure up” to the narrow beauty standards they see in the world? To recognize the thoughts and know that you have been conditioned to them by your upbringing, society, media, culture and history. There’s no truth when it comes to beauty. Even though we live as if there is. I wish it could be as easy as just “Love yourself”. And maybe the access to that love is by being aware of your self-talk and keep giving up those disempowering thoughts and embracing yourself, on a moment to moment basis. People really are absolutely irresistible and gorgeous when they own who they are. What impact do you hope to make in the world? To be someone who inspires to power, peace and love for who you are. My resilience and love for vulnerability. Vulnerability is power. And beauty.